Ever since I can remember there has been a Pik Nik snack bar at the Côte St. Luc Shopping Centre. Located by the IGA, Junior Booty, the SAQ and the barber shop, it's a snack bar surrounded by stools and some tables on the side. Hot dogs have traditionally been the most popular items there. They also make sandwiches, some other snacks and serve breakfast. A few days ago the owner, Khang, was forced to shut down operations. "The owners of this centre want too much in rent," he told me. "I cannot afford to stay, so I closed." As Khang connected his things, regulars came the counter and stared ahead in shock. "What do you mean you are closed?" one heartbroken lady remarked. The sadly abandoned Pik Nik. Will the Centre get someone else to run the operation and bring Pik Nik back to life? Until then the only places left to eat are the Subways, Muffins Plus, a sushi stop and Dominos Pizza. The IGA food counter makes some pretty good prepared meals and if you ever go there around lunchtime they drum up some good business. Who remembers the days when the Ben Ash Deli enjoyed a popular following? As for Khang, who ran the Pik Nik with his wife, I hope he is able to bounce back somewhere else. When P.F. Chang’s opened in Canada, initially in Toronto and then three years ago near Decarie next to the former Blue Bonnets Raceway and soon after at Carrefour Laval, there was a significant Côte Saint-Luc connection via Michael Aronovici who grew up in our neighbourhood and attended Wagar High School. As president of Interaction Restaurants group, he was the driving force behind bringing this famous brand to our country. I have been a P.F. Chang`s fan for a long time. Whenever our family travelled to the United States where a franchise existed, we`d make sure to dine there. We have been regulars in Montreal and thank Michael for bringing this treasure to our city. Last summer ownership changed hands when Groupe Sportscene purchased the two Montreal locations. Sportscene, the operators of the Cage Aux Sports (now known as La Cage, Brasserie Sportive,) has already utilized its golden marketing touch combined with the fortunate timing of some well received menu changes to bring back the crowds. Our most recent dining experience at the Rue des Jockeys Decarie Boulevard locale was enhanced by our server, 22 year old Côte Saint-Luc resident Natalie Solomon. Emile Haykal and Natalie Solomon. The famous lettuce chicken wraps. Next week Natalie will get to meet Philip Chiang, the founder of P.F. Chang’s (he dropped the letter “i” upon launching the restaurant) when he visits Montreal for the first time in three years. Here is the interview I did with him at that time. Going to P.F. Chang’s for dinner is more than a meal – it is an experience. The Decarie facility is beautifully designed, with two floors and tall ceilings. There is a seasonal terrace. This is a restaurant where they do not rush you. Customers can enjoy every morsel of food. As for ordering, it is a perfect place to share dishes, which enables you to budget accordingly. We went for dinner with another couple and spent three and a half hours there. This is also a great choice for family gatherings and special occasions. You can arrange for takeout as well. The amazing lobster avocado sushi. When Groupe Sportscene CEO Jean Bedard took over P.F. Chang’s, the first thing he did was drop “China Bistro” from the name and refer to the place as P.F. Chang’s. Officials travelled to the restaurant chain’s US headquarters in Arizona in order to be schooled on how to implement the new menu. While the staple favorites remain, such as chicken lettuce wraps, Mongolian beef, crispy honey chicken and shrimp, shrimp lo mein, crab wonton and more, the newest draw are the sushi rolls. We particularly love the lobster and dynamite scallop sushi rolls. And there is no better way to cap the night off by sharing the Great Wall of Chocolate cake at the table or the chocolate raspberry dessert wontons. Both operating partners in Montreal, Emile Haykal at Decarie and Elie Sucar in Laval, were kept on by Groupe Sportscene - a good move considering their familiarity with the brand. Haykal and Sucar know their business well when it comes to customer service. You can log on to www.pfchangs.ca to see the menu. For reservations call Decarie at 514-731-2020 at Decarie and Laval at (450) 687-8000. Can we save the Famous Delly Boys Restaurant from closure? A Côte Saint-Luc institution may be forced to close its doors for good by the end of October and I am wondering if there is anything we can do about it? According to my sources, the landlord will not renew the lease of the Famous Delly Boys Restaurant on Westminster Avenue. There is even a potential new owner on the horizon, prepared to totally revamp the place. His attempts to meet with the landlord have thus far been rejected. The Delly Boys was originally established in 1962 by brothers Guido (Chico) and Sonny Broccoli. It has changed hands several times over the past decade, but continues to be incredibly popular. I have virtually grown up in the place and thought of Côte Saint-Luc`s only full-scale restaurant closing its doors reluctantly after being in business for 53 years breaks my heart. People still come from across the island to enjoy their extensive menu, which contains such items as smoked meat and other deli delights, club rolls, their famous party sandwiches, pizza, pizza burgers, chicken, veal, fish, steak, ribs, pasta, salads and desserts. Whether dining in, taking out or ordering a catered meal, you will never be disappointed. I was unable to reach the landlord, Olymbec, today but I will continue to pursue them. Delly Boys special: Smoked meat, fries and a pickle. I do indeed hope they have a change in heart. As for the potential new owner, I did ask him if there are other options to establish a CSL Deli. I always felt that the Cavendish Mall (now called Quartier Cavendish) would have been a better spot for them. In fact it almost happened after Pumperniks closed and its replacement Chilis turned out to be a bust. Some of the Mall owners had discussed a Delly Boys move, but the majority of the group opted in favor of a new concept called Sternz Rhapsody. It did not work, nor did its successor Jakes. As the city councillor responsible for the Quartier Cavendish, I would love to play a role in bringing a full-scale restaurant there. But for the good of our community, I still favor the status quo where Delly Boys is right now. Wednesday May 6 is McHappy Day at McDonald's Restaurants across Canada, bringing the community together to raise money for children in need. Once again this year, local Montreal franchise owner Pierre Brunet has selected the MAB-Mackay Rehabilitation Centre as the focus for his McEfforts. For anyone who goes to one of Pierre's 11 McDonald's locations, you will have the opportunity to support the pediatric programs at MAB-Mackay. What a fine organization Pierre has chosen to partner with. Wearing my hat for the English Montreal School Board, we operate the Mackay Centre School and Philip E. Layton School for the Visually Impaired on Decarie. I stopped by the beautiful Côte Saint-Luc Road facility where I chatted with supervisor Jeffrey Ferreira, manager John Raftopoulos and Jenny Jacob and Isabelle Hartnell from MAB-Mackay. One dollar from sales of each Big Mac, Happy meals and McCafé goes to the charity. They are also selling mugs, balloons, caps and little boots that go up on the wall with your name on it. A raffle is taking place as well for a brand new adult bicycle. Jenny Jacob, John Raftopoulos, myself, Isabelle Hartnell and Jeffrey Ferreira. Pierre Brunet and his team always go the extra mile to lend a helping hand in the community, as witnessed by the incredible work done to support Manoir Ronald McDonald near the Ste. Justine Hospital. This serves as a temporary residence for families from outside the Montreal area who bring their children here for medical treatment. Everyone I saw was being very generous. Parks and Recreation District supervisor Shauna Lemieux on left with Valerie Gibson and Lauren Fairlie. - St-Jacques: 7270, rue St-Jacques O. - Gare Centrale: 895 rue de la Gauchetière O. - Westmount: 5011, rue Sherbrooke O.
Alvin Fishman from Parks and Recreation at the McDonald's Côte des Neiges locale. We encourage everyone to help make a difference in the lives of the more than 2,000 children with vision, hearing, motor and communication impairments who depend on the MAB-Mackay each year. For more information about the MAB-Mackay Foundation, call (514) 488-0043 or log on to www.foundation.mabmackay.ca. Since I was a young child, I have eaten at McDonald's more times than I can remember. But not until October 15 had I experienced a behind the scenes tour of one of the restaurants. Franchisee Pierre Brunet with Steven Erdelyim Mayor Housefather, myself, Allan J. Levine and Ruth Kovac. The occasion was a small ceremony for the brand new McDonald's which just opened at the Côte Saint-Luc Shopping Centre. It is a beautiful facility, spread over two floors with a drive through and open 24 hours a day. The place is also in the best hands possible with franchisee Pierre Brunet, certainly no stranger to our community. 'Mr. Brunet owned the McDonald's on Côte Saint-Luc Road and Walkley (actually considered NDG), which closed about 18 years ago. Among his current 16 franchises are the Quartier Cavendish food court, St. Jacques Street West, Queen Mary Road, Côte des Neiges and Linton, Beaumont in TMR, Marché Central, three in LaSalle and one Verdun. Mayor Anthony Housefather was on hand to congratulate Mr. Brunet alongside five members of council: myself, Steven Erdelyi, Ruth Kovac, Dida Berku and Allan J. Levine. Manager Don Martin brought us right behind the counter and into the kitchen. Councillors Levine and Berku could not resist the temptation of the smell of french fries. Councillor Levine (left) scooped up a medium order himself while (below) Councillor Berku requested a small one. We were joined by some of the CSL residents whose homes are right next to the facility. I was also happy to see Mr. and Mrs. Joseph Brody on hand. The two longtime residents of Sir Walter Scott Avenue in District 2 have been close friends with Mr. Brunet for years. Mr. Brunet said that without any bells and whistles, he opened the doors to the new franchise and business is already at the level he expected. When inside check out the neat digital me menus. "I am very happy to be back in this neighbourhood," said Mr. Brunet. Prepping the food in the kitchen. Côte Saint-Luc City Council adopted a minor exemption at our May 13, 2013 meeting which paves the way for a new McDonald`s Restaurant, with a drive-through (or drive thru), to be constructed at the Côte Saint-Luc Shopping Centre. 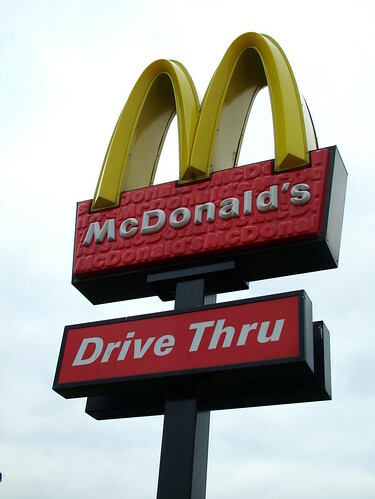 We are proud to note that we successfully requested to McDonald`s that its drive-through signs be bilingual. Presently, our community has one food court McDonald`s at the Quartier Cavendish Mall. For many years, folks with a Big Mac fix were able to fill that need at a location on Côte Saint-Luc Road and Walkley. Technically, that was situated in N.D.G. Personally, I do not go to McDonald`s that often. However, when I am between meetings I often lament that the closest drive-throughs to CSL are a Wendy`s on Decarie and a McDonald`son St. Jacques. The shopping centre came to us many months ago with their wish for a zoning change to allow for a fast food restaurant with a drive-through. I hoped for a Wendy`s-Tim Horton combo or a Harvey`s. We studied the proposal and made several recommendations. I expect the Golden Arches to be warmly welcomed here.